In 1945, Rolex introduced the first self-winding wristwatch chronometer equipped with an automatically changing date on the dial. The distinctive Cyclops lens magnifies the date for easy reading. 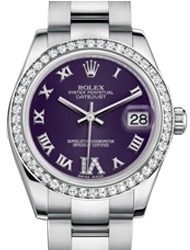 Since its introduction, the Datejust has been one of the most sought-after classic Rolexes. This flagship model provides the opportunity for many customization options and thus appeals to any taste or preference. 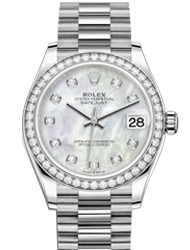 The Lady-Datejust watches grace a woman’s wrist on any occasion, whether it be a casual day or a dinner party. 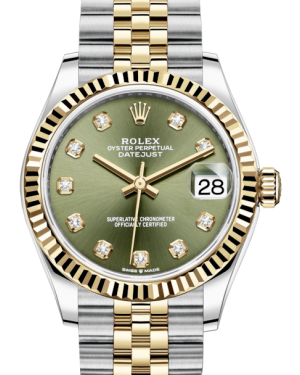 The Rolex Datejust is one of the most significant timepieces ever created by the brand and one of the most iconic luxury Swiss watches in general. 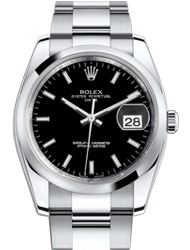 Originally launched in 1945, coinciding with the manufacturer's 40th anniversary, it was the first wristwatch to feature an automatically changing date display function. Aesthetically, the Datejust has remained fairly consistent throughout the decades, helping to make it instantly recognisable. 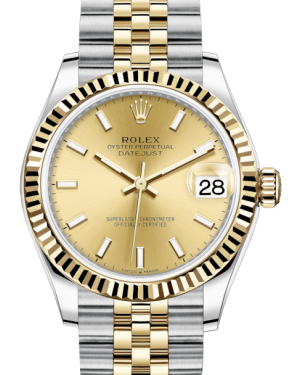 Its iconic status has been further enhanced by the list of famous people who have owned Datejust watches, including the US Presidents Ronald Reagan and Bill Clinton, who both wore the model while in office. The original model 1945 model, named the Ref. 4467, was released exclusively in 18k gold and was notable for its waterproof 36mm Oyster case and Jubilee bracelet, which would become a signature of the collection. However, its most distinctive feature was a date display window, located at the 3 o'clock position. 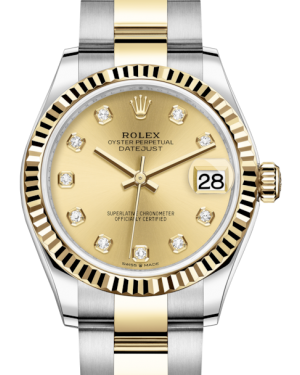 In 1947, to celebrate Rolex's 100,000th officially certified chronometer, the brand created a special Datejust model, which was presented to Great Britain's wartime Prime Minister, Winston Churchill. 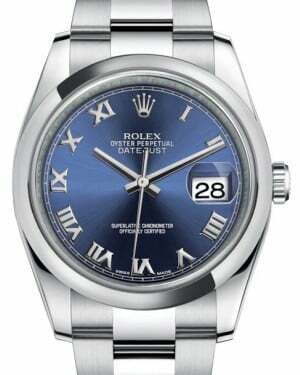 Over the course of the next few years, the Datejust emerged as the manufacturer's most popular watch line. 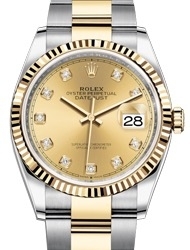 By the turn of the decade, Rolex was producing two-tone Datejust models, combining yellow gold and stainless steel. 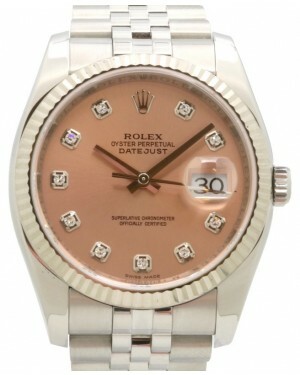 Before long, other case materials were also available, including stainless steel and rose gold versions. Since 1950, the brand has also produced a separate Lady Datejust collection, taking the core Datejust aesthetic, but giving it a more feminine appearance. Early versions were made with 26mm and 28mm case diameters, although other sizes have since been added, including 29mm and 31mm options. 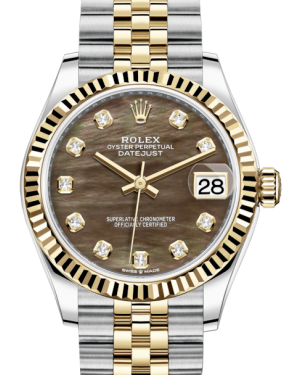 In addition to a smaller, more feminine size, many of the Lady Datejust models are decorated with diamonds, giving them an added touch of elegance. 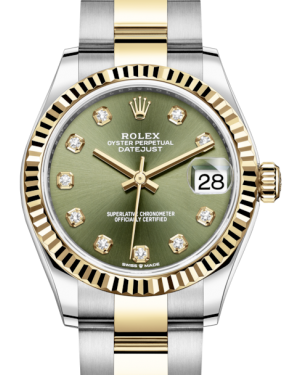 Indeed, one of the most recent major additions was the 1992 release of the Lady Datejust Pearlmaster, which is set with diamonds and other precious stones, like rubies, emeralds and/or sapphires. 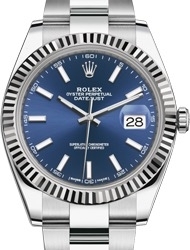 Aside from the addition of new materials, the first major Datejust design upgrade was made to the date display function. Initially, the date display would change gradually, starting several hours before midnight. 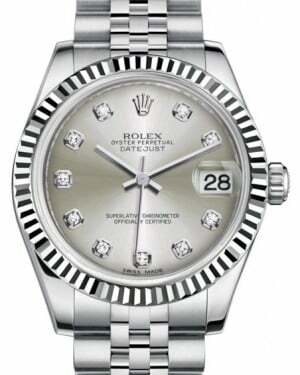 By 1955, however, all new Datejust models had been updated with intermediate gears and a spring mechanism. This change allowed the date display to change instantaneously at midnight, ensuring the correct date was always displayed. Another significant change came around the same time, with the addition of the now famous Cyclops magnifying lens, which was placed over the date display window. 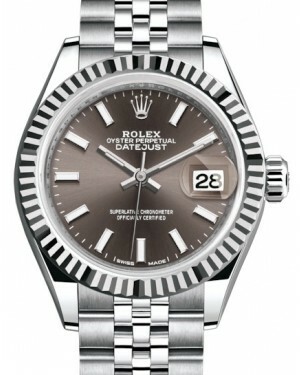 Magnifying the reading by two and a half times, the Cyclops lens helped to improve the legibility of the date display window and is now recognised as one of the most defining aspects of the Datejust design. 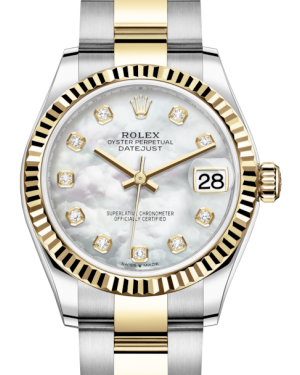 During the mid 1950s, Rolex made one of its biggest adaptations to the core Datejust design with the special Turn-O-Graph model, which was created as a gift for US Air Force pilots who were returning from active service, but was also sold to the public. These models would become affectionately known as 'Thunderbird' Datejusts. 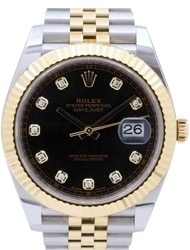 The key difference with these models was the addition of a rotating bezel and the bezel was marked to 60 minutes, allowing it to be used to measure time intervals. Chuck Yeager, the first pilot to ever exceed the speed of sound in level flight, was one of the most notable people to wear this particular model. Although it would later receive a modern relaunch, the Turn-O-Graph has now been discontinued. 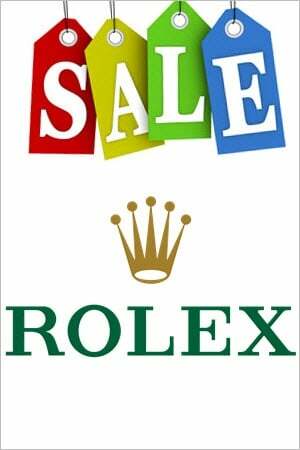 Nevertheless, it served as the inspiration for a number of later Rolex models, including the Submariner and the Sea-Dweller. 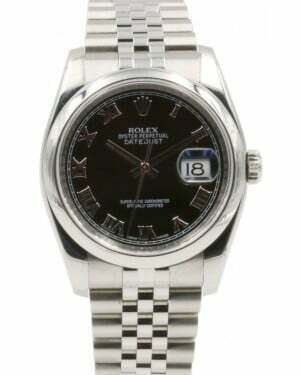 During the 1970s, new Datejust models were released containing an updated in-house 3135 movement, improving the accuracy of the models and allowing for a new quick-set feature. This change also meant a slight adjustment was made to the appearance of the Datejust, resulting in a much slimmer profile. 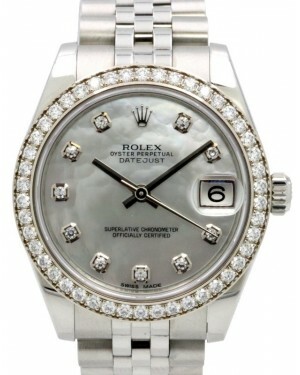 In 2007, Rolex unveiled the Datejust II, which is sold separately from the main Datejust line. Sporting a new self-winding mechanical movement, the calibre 3136, this collection is primarily defined by its larger case size, with its 41mm diameter marking a significant increase from the original 36mm Datejust case. More recently, a 41mm version of the main Datejust line was released in 2016. Available in either rose gold, or a two-tone combination of yellow gold and stainless steel, the model features a smaller bezel than the Datejust II and has a number of more subtle differences as well, such as smaller indexes.